We’d love your help. Let us know what’s wrong with this preview of Revelation 9 by Ian A. Stuart. To ask other readers questions about Revelation 9, please sign up. This book doesn't have to beg to get you to continue reading it from beginning to end. The transitions between time periods are seamless. The bible and other religious texts referenced as the basis for the story are presented in such a way that any personal religious views won't interfere. The characters are described so they continue through the story just pulling you in further and deeper even though the inevitable end can only lead toward Revelation. Enjoy the ride! Recommends it for: People who will read anything if it has heavy-handed references to apocryphal religious texts. I should note first off that this book was sent to me through the Goodreads First Reads program. Warning for some minor spoilers. Having never read any of the crop of “controversial” religious fiction that is currently experiencing a renaissance due to titles like The Da Vinci Code, I wasn't sure what to expect from Revelation 9:11. As interesting as secular takes on religious texts can be, this story smacked of appeasement towards Christianity and the Roman Catholic faith in particular. That's no I should note first off that this book was sent to me through the Goodreads First Reads program. Having never read any of the crop of “controversial” religious fiction that is currently experiencing a renaissance due to titles like The Da Vinci Code, I wasn't sure what to expect from Revelation 9:11. As interesting as secular takes on religious texts can be, this story smacked of appeasement towards Christianity and the Roman Catholic faith in particular. That's not necessarily a negative. I just found it, in the end, lacking any real punch. I'll admit that my interest in the novel was propelled along by my interest in theology. Unfortunately, that's also why many times I found myself listlessly shaking my head. Father Price is amongst the dullest, most momentum-wrecking protagonists that I've ever encountered. Perhaps it's because Price's supposedly controversial lecture to college-aged students during his introduction left me unimpressed since a layman like me read the Book of Enoch when I was in middle school, on a whim, for free online. Price is treated by other characters as some kind of eccentric with a (painstakingly documented) humility and unmatchable knowledge. The problem is, a twelve year old has access to the same information that he does, and pretentiously utilizes far less of the Socratic method than Price to have a simple discussion about it. In fact, virtually everything that he so mysteriously obsesses over can be gleaned from two semesters of theology classes in a State University. I say this only because I attended a State school and because of that, was already aware of most of the actual apocryphal information that was presented by Price as if it were some long-forgotten esoteric secret. In the real world, the information that Price uses to find his conclusions is common knowledge in theological circles both secular and faithful. I'm not saying that the character is uneducated – he just seems to behave like a desperately chatty JUCO instructor with too much time on his hands. The fact that the narrative itself indulges his delusions of rare wisdom was frustrating and only made the other characters seem less intelligent, as opposed to painting Price as brilliant. I admit, this little irritant may not bother most readers. D'Entremont, one of the secondary protagonists, hardly fared any better. Reading about the sexual exploits of a faithless priest from hundreds of years ago should not have been a relief from Price's incessant pontificating but it ended up that way. The Frenchman's two female sidekicks could have been intriguing characters but sadly fell short of their potential when they were killed off while D'Entremont lived on to bore another day. Sigh. That was my biggest problem with the novel, to be candid. Most characters had no engrossing personality or emotional depth. In an effort to conceal Price's background, he was rendered a solemnly expounding mouthpiece which made it impossible for me to form an emotional connection with him. I won't even get into the laugh-out-loud ridiculous “love story” between the female antagonist and the grossest kind of “Nice Guy” stereotype that's shoehorned (what's a stronger word than shoehorned?) in towards the end of the novel. Much like the mythical island that hosts the climax to this tale, emotional resonance between any of the characters can be approximated and hazily seen from far off, but you'd be hard-pressed to find any proof of it. I grew weary of meeting new characters, hoping that they would be engaging and charismatic and then continually being disappointed. I wish I'd gotten the chance to know and care about the orphans, who could have been compelling individuals. Distant stars may align for an amazing purpose, but if there isn't more to a character's development than getting them from point a to point b then there's a problem. I probably come off as overly harsh on this book, which never hurt anybody and doesn't possess the narrative dexterity to be capable of doing so. And maybe that's why I am so let down. In the end, what I'd read felt empty and joyless, like an academic exercise. It didn't make me feel curious, tense or even sufficiently entertained. It's a book that ultimately aims to carefully reinforce a preexisting worldview through well-trodden means and not enough heart. I truly do wish that I could have been left with a positive impression of this book, but I'm just glad that it's finished. My thanks to Goodreads and the First Reads program for selecting me to read and review this book. Father Benjamin Price, a Catholic priest, has just released a controversial new book about a trans dimensional portal that he believes leads to an astral prison containing fallen angels. These angels, he claims, were imprisoned by God for committing sins of the flesh and fathering a race called The Nephilim. Naturally, he is met with some resistance and is summoned to Rome. After his hearing at the V My thanks to Goodreads and the First Reads program for selecting me to read and review this book. Father Benjamin Price, a Catholic priest, has just released a controversial new book about a trans dimensional portal that he believes leads to an astral prison containing fallen angels. These angels, he claims, were imprisoned by God for committing sins of the flesh and fathering a race called The Nephilim. Naturally, he is met with some resistance and is summoned to Rome. After his hearing at the Vatican, Father Price is sent to work at an Orphanage in Baltimore, where he comes in contact with five children, all of whom have been touched by angels; especially Erik Stone, whom Father Price learns is actually the child of Abbaddon, a fallen angel of special note. Abbaddon, it turns out, escaped during the 18th century and set into motion a series of events that will culminate into a cataclysm of epic proportions. Father Price believes that he must help these extraordinary children, Erik Stone in particular, to thwart Abbaddon’s plans, which will come to fruition in the near future. While I enjoyed the fast paced storytelling and brevity of the chapters, I have some issues with the character and plot development. I know that this is meant to be the first installment in a trilogy, and that the series will probably see many characters come and go, but it was very frustrating for me when, all of a sudden, mid-way through the book we lost track of the protagonists (or so we thought them to be) and were introduced to a completely new set of characters during a completely different time period. This happened, again, about three quarters of the way through; in fact, I feel like Revelation 9:11 is really comprised of three smaller books stitched together. Why not do alternating chapters between the three character groupings like the ASOIAF series? I just feel strongly that there are some structural weaknesses in the storytelling that need to be ironed out for the coming sequels. In sum, there are some interesting ideas presented in the book and I’ll probably end up researching the fallen angels mentioned because I think that the Nephilim sound fascinating. If you enjoyed Dan Brown’s The Da Vinci Code, you’ll probably like Revelation 9:11 because it contains the same blending of esoteric religious and historical elements. THANK YOU GOODREADS FIRST READS AND Ian A. Stuart! Well it took me longer than expected to finish this book. I became engrossed very quickly as it was a great subject. Shortly after starting though I quickly became lost. The book tends to jump through different time periods without warning or explanation. I know this is something done quite often but it was too confusing. The author had me captivated early of with the children and how they seemed to have this unique connection and the excitement was building in this part of the story. Suddenly the children are adults and going their separate ways. This was a disservice as they were the most interesting part of the book. Eventually we get back to them and jump briefly into their adolescence but it is too little too late. The main character is intriguing learn the amazing and terrible truth about him in the end. But the book is over too quickly in the end. I think the story would be served better with a longer beginning, a shorter middle and a longer finale. I kept putting the book down for hours because it just lost my interest in the middle. When I first got this book I was really skeptical about it. The cover especially was a big draw back for me. It was a pleasant surprise when I actually got into it and read it. The story of Father Benjamin Price, a professor. He is enthralled by the ancient books that are mentioned in the Bible, but are not in it. When his authorities (aka. bishops and cardinals) get wind of what he is doing, they call him to Rome where they are located. There they tell him under no circumstances is he allowed to When I first got this book I was really skeptical about it. The cover especially was a big draw back for me. It was a pleasant surprise when I actually got into it and read it. The story of Father Benjamin Price, a professor. He is enthralled by the ancient books that are mentioned in the Bible, but are not in it. When his authorities (aka. bishops and cardinals) get wind of what he is doing, they call him to Rome where they are located. There they tell him under no circumstances is he allowed to teach, write, etc. of the things he has researched. Now that his teaching job has been taken away from him, he gets sent to an orphanage where he is to be the priest. When he arrived he came upon a mystery that has him baffled for years to come. I am not going to tell you anymore. This is a book where you can't really judge it by its cover. I enjoyed strange though it was. I won this book as part of a Goodreads First reads giveaway. The first 2/3 of this book remind me of a Quentin Tarantino movie. It jumps back and forth from present to ancient past and several areas in between. That said, I don't think it's confusing because the authors clearly label the date in the chapter heading when one of these jumps occurs. Its the story of a fallen angel, a priest who is trying to earn his salvation, and ultimately the downfall of humankind. The final 1/3 of the book is all I won this book as part of a Goodreads First reads giveaway. The final 1/3 of the book is all present day (give or take) and it wraps up the storylines of all the main players. I found this part to be the best part of the book. It goes at a quicker pace than the beginning and really intrigued me. It leaves the story open for a sequel. the book it drew me in. The novel was a very enjoyable read. Each chapter kept me interested in what might happen next. 'Revelation 9:11', as you might expect, contains some supernatural elements. At first not really sure what sort of book this was or where it was going, I suppose a religious adventure mystery would sum it up nicely. Spanning across time, Angels, fallen and by God's side, Priests, twins born from an angel and a mysterious "extinct" tribe all come along for the ride to an island that may or may not exist in the middle of the Atlantic. At first I found it a bit slow, but started to get to know the characters, probably best to try and read this almost in one go, but once it t At first not really sure what sort of book this was or where it was going, I suppose a religious adventure mystery would sum it up nicely. Spanning across time, Angels, fallen and by God's side, Priests, twins born from an angel and a mysterious "extinct" tribe all come along for the ride to an island that may or may not exist in the middle of the Atlantic. At first I found it a bit slow, but started to get to know the characters, probably best to try and read this almost in one go, but once it takes a surprise turn to 1940s era and World War 2 it really starts to pick up pace and then it doesn't let go. Wasn't too certain, from its cover, just how much or little I was going to get into this novel. It was so well-written and interesting that I jumped pretty much RIGHT INTO it the first evening after receiving the book. Several mysteries and diverse characters were spectacular anchors to keep and continue reading. Fine work Mr.Stuart and Mr.Franklyn. I see that there may be a sequel. THAT I would LIKE VERY MUCH to read ! Thank you librarything member giveaway program for my receiving of this book Wasn't too certain, from its cover, just how much or little I was going to get into this novel. It was so well-written and interesting that I jumped pretty much RIGHT INTO it the first evening after receiving the book. Several mysteries and diverse characters were spectacular anchors to keep and continue reading. Fine work Mr.Stuart and Mr.Franklyn. I see that there may be a sequel. THAT I would LIKE VERY MUCH to read ! Thank you librarything member giveaway program for my receiving of this book. I probably never would have read it but for this program, and THAT would have been my loss. Note: I rate this book at 4.5 to 5 ***** (stars) rating out of 5.0 stars. Thought-provoking, provocative and truly remarkable!! This extraordinary, notable novel has one of the most eye-catching, striking covers that I have ever encountered touching your imagination. The clever blurb consists of a few questions which touches your curiosity, making you want to read the book and find out more. This thrilling adventure takes you on the journey of a lifetime into the unknown, into a great abyss and to the end of the world itself. Visions of heaven, the mortal human and th Thought-provoking, provocative and truly remarkable!! This extraordinary, notable novel has one of the most eye-catching, striking covers that I have ever encountered touching your imagination. The clever blurb consists of a few questions which touches your curiosity, making you want to read the book and find out more. This thrilling adventure takes you on the journey of a lifetime into the unknown, into a great abyss and to the end of the world itself. Visions of heaven, the mortal human and the divine make this supernatural thriller is something utterly unique and original. 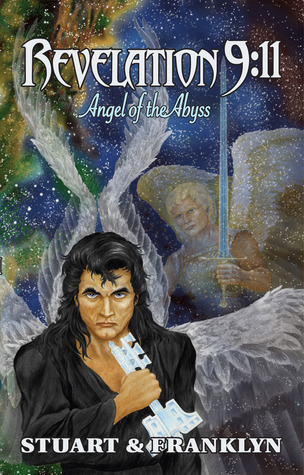 Seraph is a destroyer angel of the Old Testament and also the angel of the abyss in revelation, he is a most interesting and distinctive character that makes this story quite outlandish in its design. Slightly bizarre and peculiar at first I began to then loose myself in a most gripping tale set in many different centuries as one flashes backwards and forwards in time, where there are murderers on the loose, religious men and archeologists digging into the foundations of the earth. With a collection of fascinating characters from the archangel Michael to a cornel Adler, the king of France and the pope himself this is a tale that truly comes to life before your very eyes. The destiny of Father Benjamin Price is in their hands as his un-shifting burden continues to weigh him down like led, as not only his fate is decided but the entire destiny of the human race. This compelling puzzle and well-crafted mystery with a supernatural backdrop is a book like no other, which I could only compare to a Dan Brown or Mac Carthy that leaves you guessing right until the very end. The electric tension and suspense sends chills down your spine as you journey through time itself and come face to face with the divine, the holy and the immoral. This is a story of redemption for a fallen angel and for a priest, whose combined destiny and fate leads to the future of the entire human race in a most dramatic and unexpected conclusion. Jumping from one section to another you get a sense of the epic scale of this saga and how it affects other characters, interlinking them in a labyrinth/ web that is ingenious. From a religious point of view I found this to be a most fascinating story, as I have been brought up with the Christian teachings and the perspective of both Stuart and Franklyn was so captivating. This is an absorbing, magnificent masterpiece that will delight and wonder, as you loose yourself within a detailed impressive story. I cannot thank Ian A Stuart and David R Franklyn enough for having their novel on a GoodReads giveaway, which I am most fortunate and privileged to have read. This is a book that touches on ones subconscious, seeping down into the depths of your very soul making a hole in your heart. This novel completely fascinates me with its inspired plot, remarkable characters and incredible ending that blew me away as I was not expecting it. I won a copy of this book in a goodreads giveaway. This book was actually not bad, just not one that I would normally read. The vibe I got was sort of fantasy meets religion written by a Dan Brown type. While the story wasn't bad, I took forever to actually pick it up because of the cover. A much better job could have been done in the design. It really takes away the appeal for any readers past the age of 16 or so. I did find the idea of the angels and nephilim and such to be rather interesting. I won a copy of this book in a goodreads giveaway. I won this book free through a Goodreads First Reads giveaway. A good read. The writer wrote this book very well. I wanted to keep turning pages to read more and more of the book. I only wish the cover were more appealing. Just goes to show the saying is right That you should never judge a book by its cover. The cover was not appealing to me but am glad I gave the book a chance as I thought the synopsis sounded very good. The plot and characters are very well developed. I am trying to contact Dave R Franklyn or an Stuart. The last telephone number I had for them is no longer in service. If this is not possible, could you please advise me of any problems with locating him. Loved it great Book! I liked the mixed of fantansy and fiction! It was a fast past story. It kept me wanting to read more. Great book!